Getting a Christmas tree and trimming it is one of the most popular of all Christmas traditions. A Christmas tree is a traditional part of how many people celebrate the holidays. Choosing a tree, then decorating it with the family while listening to Christmas carols is what Christmas memories are made of. Here are some tips on choosing and caring for a live Christmas tree. First, it can sometimes be a little confusing as to when to buy a Christmas tree. Many people choose the weekend after Thanksgiving. However, although this tends to be the most popular weekend for tree purchases, it is not necessarily the most optimal time. Mid-November is actually a better time to shop for a tree, if you want to have the best selection. After all, if you wait too long, you will be forced to choose from the trees that other shoppers did not select. Although mid-November might seem to be a bit early, it is important to keep in mind that the Christmas trees sold during the weekend after Thanksgiving were probably cut by mid-November. By selecting and purchasing your tree early, you will have a chance to store it properly and get it into water so that it stays fresher longer. That way, even if you wait until the weekend after Thanksgiving to put the tree up and decorate it, it will still be fresher than a tree that sat around without water for a week or so, waiting to be sold. If you want to keep your tree at optimal freshness, plan on keeping it in a stand filled with fresh water in a cool location. By purchasing an extra-fresh tree early and caring for it properly, your tree should stay beautiful and safe within your home for a full four to six weeks. As you decide when to buy a Christmas tree, it can also be helpful to remember how warm and inviting a decorated tree makes your house feel. Why wait until after Thanksgiving in order to enjoy the beauty of your tree? If you put the tree up the day before Thanksgiving instead of the weekend after, you will be able to enjoy its beauty throughout not just one holiday, but two. The first thing that you need to decide is how you plan to get your tree. Some people head out to tree farms months before Christmas and they choose their tree before they are cut down. Customers are allowed to look through the still growing trees and tag the one that they want. When the tree is ready to be cut down, customers can pick up the tree that they had chosen. Other people choose to go to Christmas tree lots which sell trees closer to Christmas that have already been cut and are ready to be put up. Some people choose artificial trees which are purchased in stores and can be used year after year. These trees come in different shapes and sizes. Some come with fiber optic lights at the tips of the branches, making stringing Christmas lights unnecessary. Most people choose real Christmas trees because they look better, they are much more full. They also choose real trees so that they have the smell of pine in their homes during the holidays. There are over 35 species of evergreen trees grown in the United States for Christmas. Douglas Fir: The Douglas Fir is a very popular tree. These trees grow best in mild humid climates where the summers are especially dry. These trees grow in a pyramid shape and have needles that range from blue to dark green. In general, firs are considered the best smelling Christmas trees. 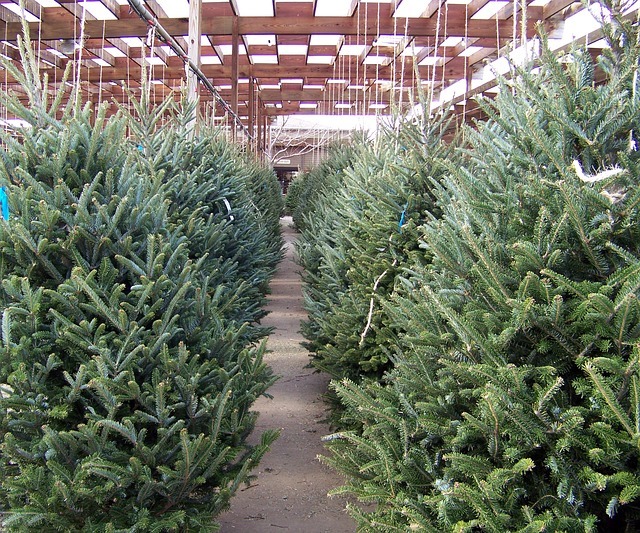 Fraser Fir: This tree grows in climates where the winters are extremely cold and the summers are not especially hot. These trees are known for their strong pine scent. The colors of the needles on these trees are different in all areas. The tops of these trees are a deep green color and become a silvery white color towards the bottom. This tree illuminates ornaments excellently. Noble Fir: This tree is grown in the Pacific Northwest. It has blue-green branches which are very well spaced. Because the needles curve upwards, this tree has a nice, full look. Scotch Pine: This tree is the most popular choice for a Christmas tree. This tree can grow in a wide variety of climates and soils, making it available in most states. This tree is in the shape of a cone and tend to grow very full with little branch spacing. Eastern White Pine: This tree loves moisture. It also grows very fast. It can grow in many climates making this tree widely available. With its very strong smell and its long needles which are soft green in color, this tree is a popular choice. Virginia Pine: This is a very popular tree in the Southern states because this tree can tolerate warm weather. This tree holds its needles well, making less of a mess and allowing it to withstand weeks of being on display. Grand Fir: This tree slightly resembles the Fraser Fir. It has bi-colored needles like the Fraser Fir. This tree grows best where the summers are cool, winters are long, and the air is always humid. Eastern Red Cedar: This is a very popular tree in the Eastern states. It can grow during drought, extreme cold, and wind. This tree has a very strong scent. Once you have chosen your tree and you have it home, it is important to know how to take care of it in order to keep it healthy the entire time it is on display. If it is possible, it is best not to have the cut surface of the trunk exposed to the air for more than 3 to 6 hours. This is why tagging your tree and taking it home right when it is cut is an excellent idea. After you have the tree at home, you should remove the bottom branches. This will allow the tree to slide properly into its stand. You should also prune any ragged branch tips, making your tree symmetrical. Next, you want to use a sharp saw and cut about an inch off the base of the tree. This will allow your tree to absorb more water, keeping it healthier, longer. You should also use the saw to remove the sappy seal that has formed over the tree’s base. Once you have the tree in the stand, you should fill the stand with warm water. Cold water can shock the tree. The tree will drink a lot of water in the first few days. It is important to check the tree often to make sure that it has a sufficient amount of water. If you allow the water in the stand to dry up, you risk killing the tree by drying it out, creating a fire hazard. The better you care for your tree, the healthier it will be.